VHS (Video Home System) is a recording and playing standard for analog video cassette recorders (VCRs). It was developed by Victor Company of Japan, Limited (JVC). Originally launched in 1976, VHS became a standard format for consumer recording and viewing by the 1990s, after competing in a fierce format war with Sony Corporation's Betamax and, to a lesser extent, Philips' Video 2000. 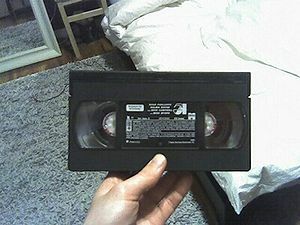 Although still popular for home recording, the VHS tape has largely been replaced by DVD for pre-recorded home video content. As of July 2006, most major film studios have stopped releasing new movie titles in VHS format, opting for DVD-only releases. In the 1980s and 1990s, most spanking videos sold were on VHS cassettes. By the turn of the millenium, a mixed-media phase began in which videos were released both on VHS and DVD format. Today, new videos are generally released on DVDs only; only a few video producers still offer their films on VHS cassettes. This page uses content from Wikipedia. The original article was at VHS. The list of authors can be seen in the page history. As with Spanking Art, the text of Wikipedia is available under a copyleft license, the Creative Commons Attribution Sharealike license. This page was last edited on 16 October 2008, at 22:34.